Pop-ups are advertisements that are displayed in a new browser window. They can show up either in the foreground or under the currently active content. Despite the growing presence of ad blocking tools, pop-up ads are still desired by numerous website owners who wish to make a peaceful leaving and secure their web activity thanks to money earned with this ad type. Knowing that website owners were looking for an alternative to their pop-ups or were eager to try something else than link monetization and interstitials, we took certain steps to allow every publisher in shorte.st to try and enjoy the power of pop-up ads. If you are willing to use just pop-up ads, you will find your unique code here. As you can see, no other module is active but pop-ups. 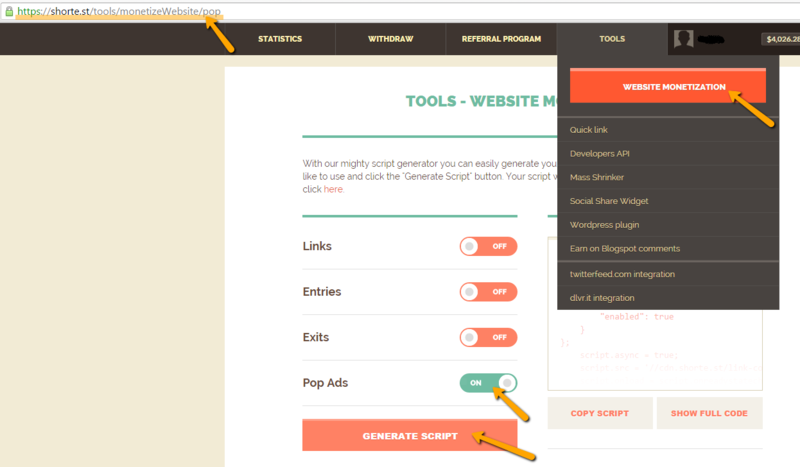 You can now copy the script and paste it into your website above the body closing tag (</body>). There will be one ad displayed to a unique user in 24 hours. However, we highly recommend adding exits monetization to your pop-up code. You are one button-click away from it, and so, very close to extra revenue. 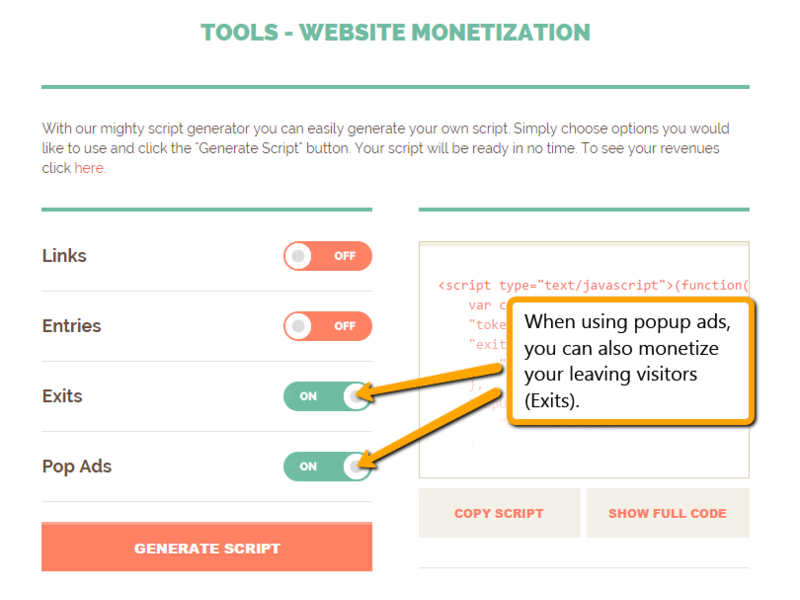 Exits or Exit Script does a little magic and turns leaving visitors (bounce rate) into money. This tool does NOT influence your regular visitors who stay a while or click something on your website. In shorte.st New Statistics you can monitor your Exits results and if you don’t like it, you can stop anytime. 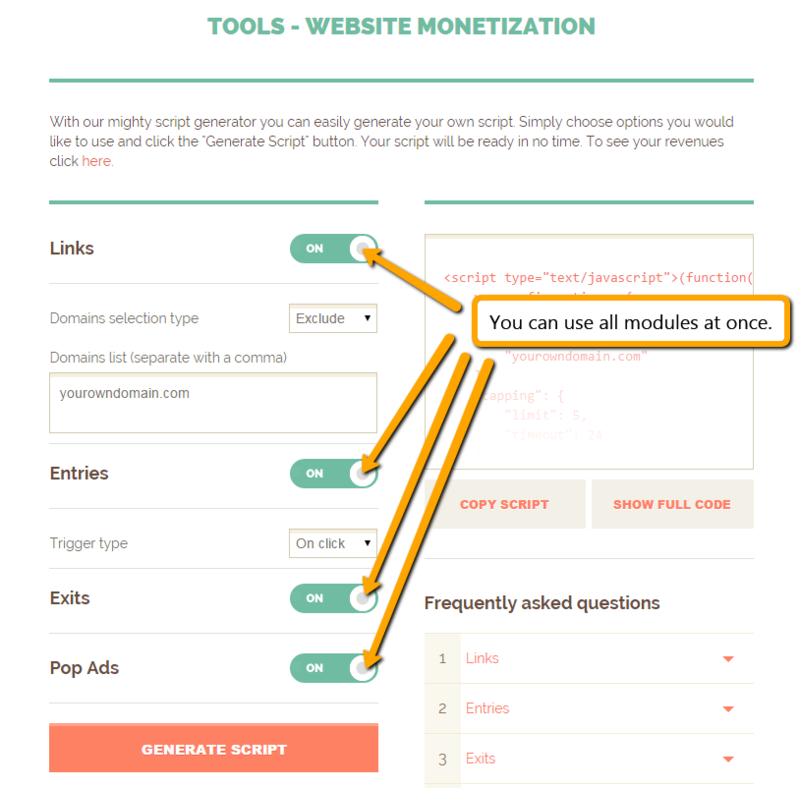 For those of you who fancy shorte.st solutions such as entry or link monetization, the task will be as follows. Generate the script including all modules you wish to use. Then, copy the script and paste it into your website. 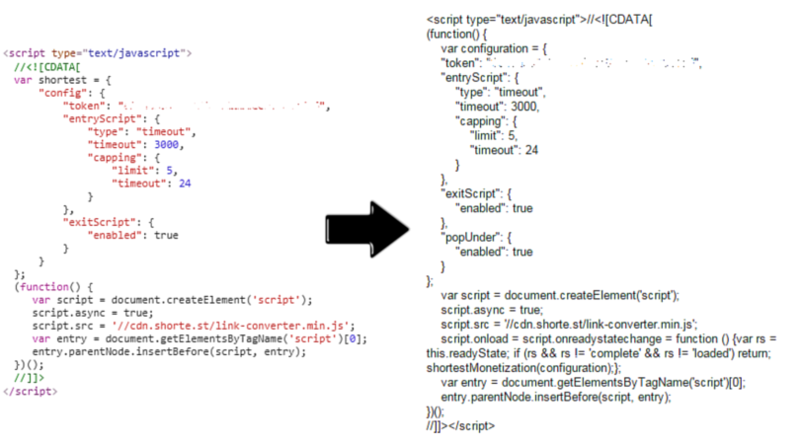 Now, an important clue for publishers with shorte.st script already in their websites. If you’re about to use pop-up ads as well, find and remove your current shorte.st code from HTML and use the newly generated code instead. It’s the simplest pop-up integration ever. Pop-ups are effective in catching attention and generating clicks which result in a good conversion rate. Therefore, adding pop-ups to your website can visibly grow your income giving you more money in your shorte.st account. As to shorte.st pop-up ads, the content is carefully chosen to generate true interest and let your audience enjoy relevant and useful ads. Also, the frequency of ad display is as low as possible, it’s one ad in 24 hours, so it’s not anything your users wouldn’t see on other websites. Those more determined would have an ad killer installed anyway ;). If there is anything you’d like to ask us about regarding pop-ups or shorte.st in general, contact us at contact@shorte.st. We’ll be happy to help.